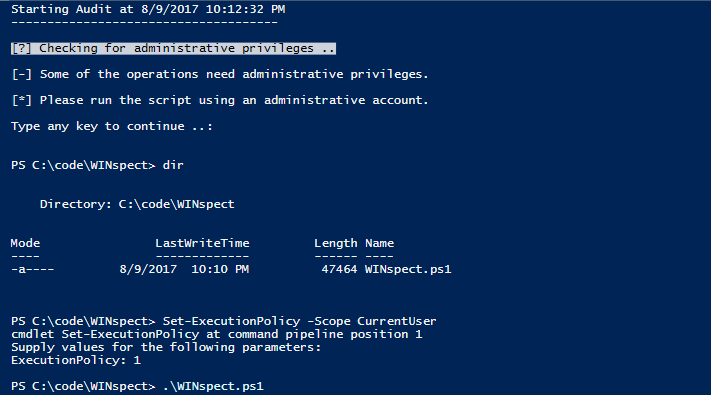 Browse: Home / winspect – Powershell based Windows Security Auditing Toolbox. 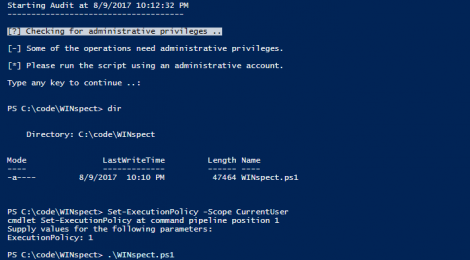 winspect is a part of a larger project for auditing different areas of Windows environments. 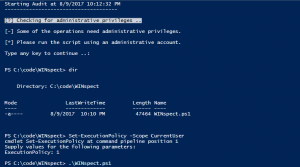 It focuses on enumerating different parts of a Windows machine aiming to identify security weaknesses and point to components that that need further hardening. The main targets for the script are domain-joined windows machines. However, some of the functions can also be invoked for standalone workstations. + Gets domain users and groups with local group membership. + Given a specific ADSI group object, it checks whether it is a local or domain group and looks fro its members. + Checks current configuration of User Account Control. + Checks DLL Search mode and inspects permissions for directories in user and system %PATH% . + Gets services whose binaries are writable by current user. + Looks for services with unquoted path vulnerability. + Gets all services that the current user can configure. + Looks for autoruns specified in different places in the registry. ← BinaryAlert – Serverless, Real-time & Retroactive Malware Detection.